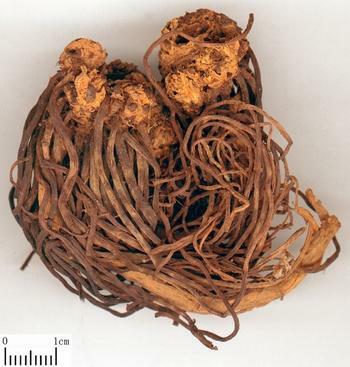 The dry root and Rhizoma of perennial herbaceous plant Aster tataricus L. f. of family Compositae. Hebei, Anhui and Heilongjiang provinces and so on in China. Lightly fragrant smell, sweet and slightly bitter taste. Long, violet, soft and elastic, without stem and sprout. Dried in the sun or stir-baked with honey. Bitter, pungent, sweet, slightly warm; lung meridian entered. It is often used after stir-baked with honey. Being sweet in flavor, it is moistening. Being bitter in flavor, it is purging. It is pungent and warm without dryness. So it is good at directing qi downward also moistening lung to stop cough and resolving phlegm, it is combined with herbs to treat cough with phlegm caused by external contraction or internal injury, or cold and heat, or deficiency and excess syndromes. For cough due to wind-cold with symptoms of persistent cough and dryness phlegm, it is often combined with wind-cold-dispersing herbs and lung-ventilating to resolve phlegm and stop cough herbs, such as Jing Jie and Jie Geng and so on. For cough due to lung heat with symptoms of profuse yellow thick phlegm, it is often combined with heat-clearing and phlegm-resolving herbs, such as Huang Qin and Chuan Bei Mu and so on. For cough due to lung yin deficiency with symptoms of bloody phlegm, it is often combined with E Jiao, Chuan Bei Mu and Zhi Mu and so on, in Wang Hai Zang Zi Wan Tang. Decoct 3~10 g. It is mostly stir-baked with honey.